The following Application Notes are available. Please contact us on sales@episentum.com stating your contact details and research interests, and we will e-mail the requested Application Notes back to you. 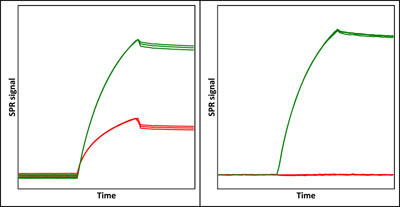 Application Note 026: LE-SPR improves the performance of high-end SPR instruments Due to optimized optical hardware as well as data evaluation software, modern SPR instruments can quantify signals well below 1 Resonance Unit (RU). However, with the introduction of the latest generation of SPR instruments in recent years, the achievable instrument improvements have most likely reached the end of the road. Even so, in this Application Note 26 we show that Label-Enhanced SPR significantly enhances the performance of the high-end Biacore™ T200 instrument. 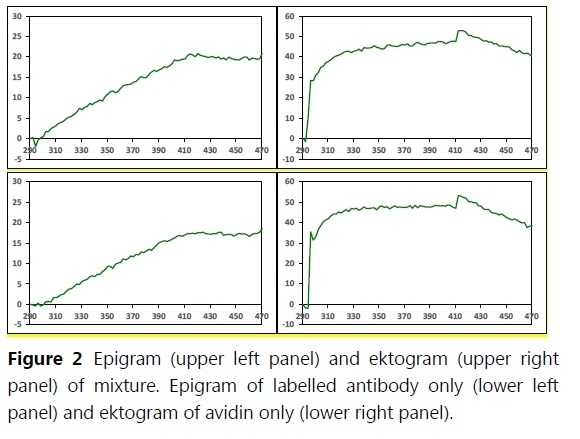 The raw LE-SPR epigrams show considerably less disturbances than the raw conventional sensorgrams. The cleaner raw data reduces the need for complex data manipulation, thereby minimizing the risk of introducing uncontrolled data distortion. The final epigrams are superior in terms of short term noise as well as general disturbance level. Application Note 025: Simple and efficient solvent correction in SPR analysis Surface plasmon resonance (SPR) analysis is often plagued by bulk refractive index disturbances caused by variations in the solvent composition of samples. The problem is especially pronounced for small molecules in buffers with varying DMSO content – even the tiniest variations in DMSO content cause large bulk disturbances. Cumbersome solvent correction procedures have been developed to, at least partly, reduce this problem. Label-Enhanced SPR, on the other hand, is immune to variations in bulk liquid composition, so solvent correction can be significantly simplified or even omitted. In many cases there is no need to run any reference channel or double-referencing procedure to compensate for DMSO variations. This translates into a reduced level of disturbances, a simplified experimental procedure and also a more efficient use of sensor chips, lower chip consumption, and higher sample throughput. Application Note 024: Dual-colour SPR – discrimination of two simultaneously binding species Surface Plasmon Resonance (SPR) is usually regarded as an indiscriminate biosensing technique that monitors the binding of any molecule to the sensor surface, without being able to determine the identity of the binding species. However, using Label-Enhanced SPR, it is possible to discriminate and quantify the binding of two species simultaneously, even on standard single-wavelength SPR instruments. This feature is very valuable, for example, when studying complex biochemical binding mechanisms, such as competing reactions or allosteric effects. Here we present an example on a Biacore™ SPR instrument: the resolution of a mixed, two-species sensorgram into two separate sensorgrams for the two components. Application Note 023: Improved specificity increases detectability of antibodies by SPR analysis 100-fold In SPR analysis of antibodies, detection sensitivity is seldom a limiting factor since antibodies are heavy molecules that yield strong responses. Rather, it is the unwanted binding of other substances from impure sample solutions that limits the detectability, i.e. the ability to detect low concentrations of antibody. Label-Enhanced SPR significantly increases the specificity of the analysis and the effects of non-specific binding are essentially eliminated, which substantially improves detectability. Here we present an ELISA-like SPR immunoassay, and show how the Label-Enhanced SPR format improves detectability 100-fold. Application Note 022: Improved protein concentration analysis applied to an inhibition-in-solution (ISA) assay Label-Enhanced SPR improves the sensitivity, signal-to-background ratio, and dynamic range of protein concentration assays run on surface plasmon resonance instruments. 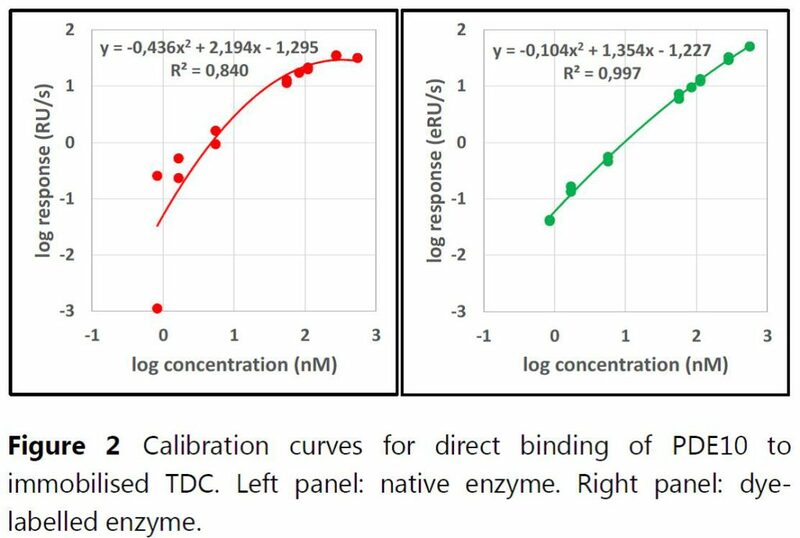 Here we show how dye labelling of a protein extends the dynamic range in the lower as well as the upper concentration range. 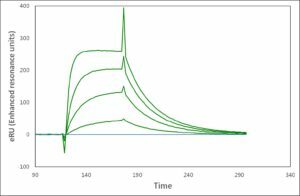 We apply Label-Enhanced SPR to an inhibition-in-solution (ISA) assay to determine the binding dissociation constant KD between the enzyme PDE10 and a number of low molecular weight compounds in solution. The method shows an increased dynamic range, improved detection limit, and good agreement between KD and IC50 values. 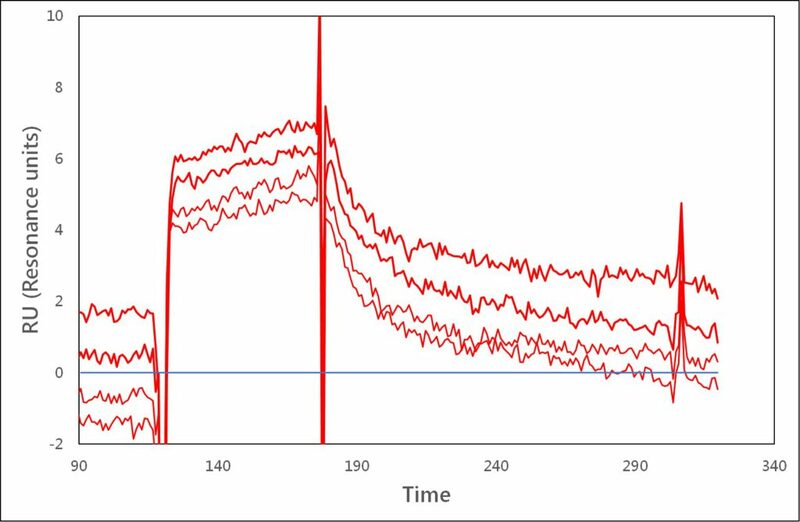 Application Note 021: Expanding the kinetic space with Label-Enhanced SPR Interactions characterized by similar affinities can have very different on- and off-rates. The on-rate is a measure of recognition between interacting partners, or the willingness with which interacting partners associate. The off-rate indicates the stability of the complex. Splitting affinity into on- and off-rates provides a much deeper understanding of how the dynamics of molecular interactions relate to protein function. The range of kinetic rate constants that can be determined is greatly expanded by using Label-Enhanced SPR and extends the study of small weakly binding fragments beyond steady state analysis. Application Note 020: Label-Enhanced SPR – A primer on technology and applications Surface Plasmon Resonance (SPR) is the physical principle utilized in most optical biosensors. SPR is widely used in biomolecular analysis and is particularly valuable for monitoring binding, affinity, kinetics, and concentration in real time. However, conventional SPR technology still suffers from a number of technical limitations, mainly related to limited sensitivity and limited specificity. The Label-Enhanced SPR technology of Episentum breaks the limitations of conventional SPR technology, resulting in significantly improved sensitivity and specificity. Here we briefly describe the functional principles behind Label-Enhanced SPR and how its strongly improved performance translates into benefits in different applications. Application Note 019: Competition-based screening and characterisation with Label-Enhanced SPR The Label-Enhanced SPR technology from Episentum greatly improves the performance of your surface plasmon resonance (SPR) biosensor instrument. The signal-to-noise ratio is improved about 100-fold on a mass basis. Reference subtraction and solvent correction, i.e. DMSO correction, are not needed. Our approach is therefore ideal for the analysis of small molecules and fragments. The principle is simple and can be performed on your current instrument without modifying any hardware. 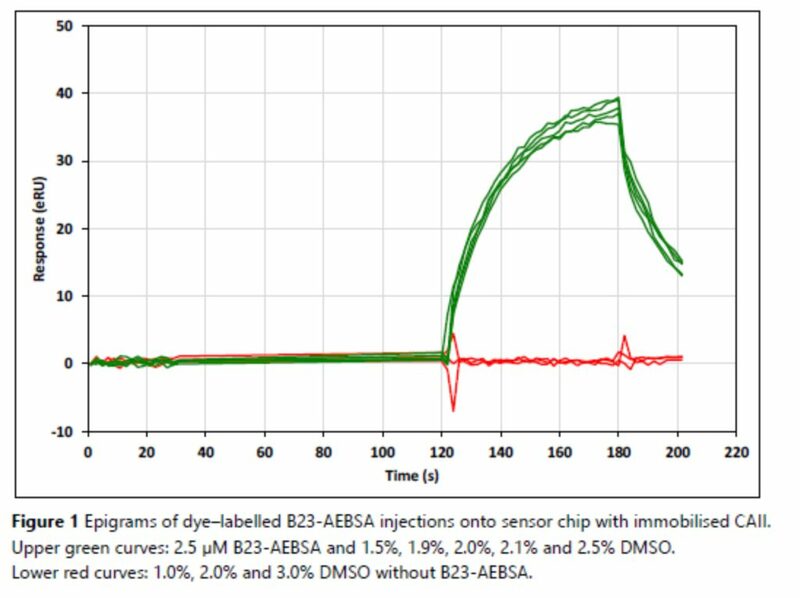 Application Note 018: Increased Sensitivity and Improved Kinetic Analysis on Biacore Instruments The Label-Enhanced SPR technology of Episentum greatly improves the sensitivity and specificity of biomolecular interaction analysis using Biacore™ SPR instruments. The B2 series SPR dyes, with outstanding optical properties, offer increased sensitivity, lower noise, and enhanced detectability. 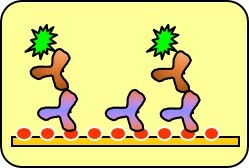 The B2 series labels enable reliable monitoring of the binding of even the smallest molecules in a simple competitive assay format. In addition, accurate kinetic analysis can even be performed without a reference cell. The analysis is performed on a standard Biacore 2000 instrument using an existing pre-defined kinetic model. Application Note 017: Biomolecular Interaction Analysis on Biacore 2000 with Enhanced Sensitivity and Specificity The Label-Enhanced SPR technology of Episentum greatly improves biomolecular interaction analysis on Biacore™ 2000, giving exceptional sensitivity, excellent specificity, low drift, a negligible solvent effect, and a clean kinetic evaluation. This technology extends detection limits, in terms of both concentration and molecular weight of the analyte, and also the range of kinetic values that can be determined, from the fastest on-rates to the slowest off-rates. Previously borderline samples, e.g. low-molecular weight (LMW) compounds and low abundance proteins, can now be analysed with confidence. 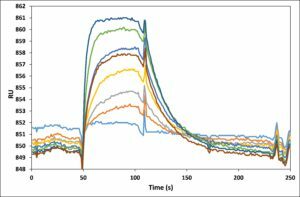 Application Note 016: Multi-Colour SPR Analysis at a Single Wavelength Using the Label-Enhanced SPR technology of Episentum in combination with a standard single-wavelength SPR instrument, it is possible to detect and quantify the binding of several differently coloured molecules simultaneously. This method can be used, for example, in proteomics to study competing reactions or allosteric effects, and in genomics to study competing hybridization or to perform four-colour mini-sequencing. 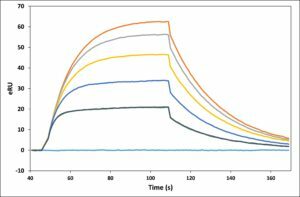 Application Note 015: A Simple Single-Step Procedure for Solvent Correction in SPR Analysis By using Episentec™ dyes, bulk refractive index variations can be corrected for in one simple step and without the use of a reference surface. Binding levels and kinetic properties can thereby be accurately determined, even for small molecules and in samples of varying refractive index. 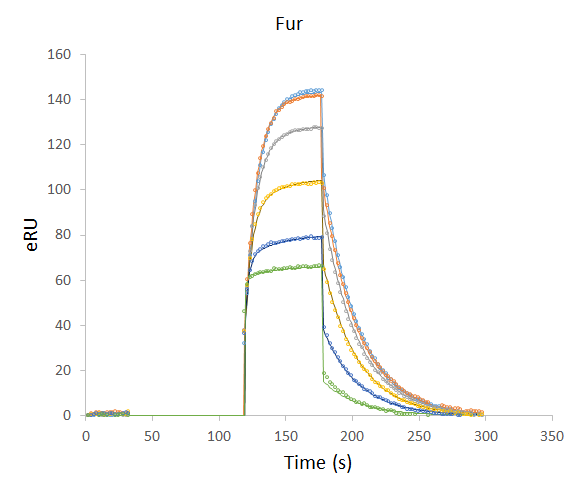 Application Note 014: Real-time Analysis of DNA Hybridization with Enhanced Sensitivity and Specificity on BioNavis SPR Navi It is demonstrated how real-time SPR analysis of DNA hybridization can show a specificity comparable to that of fluorescence analysis. Furthermore, the sensitivity is improved and a significantly cleaned-up sensorgram is obtained. Application Note 013: Competitive Analysis of a Small Molecule Model System This Application Note describes how the sensitivity of small molecule analysis with SPR using a competitive format and Episentec™ dyes is increased to levels previously unattainable in the absence of labelling with much larger molecules. Application Note 012: Enhanced Sensitivity and Specificity of a Small Molecule Model System This Application Note shows how the use of Episentec™ dyes and subsequent analysis with EpiGrammer™ software greatly enhances the analysis of low molecular weight compounds in terms of enhanced sensitivity and enhanced specificity.